“My fiancé is going to be pretty happy about this,” says Lindsay Stevens of Colombia City as she stands in line and waits to purchase her wedding dress. 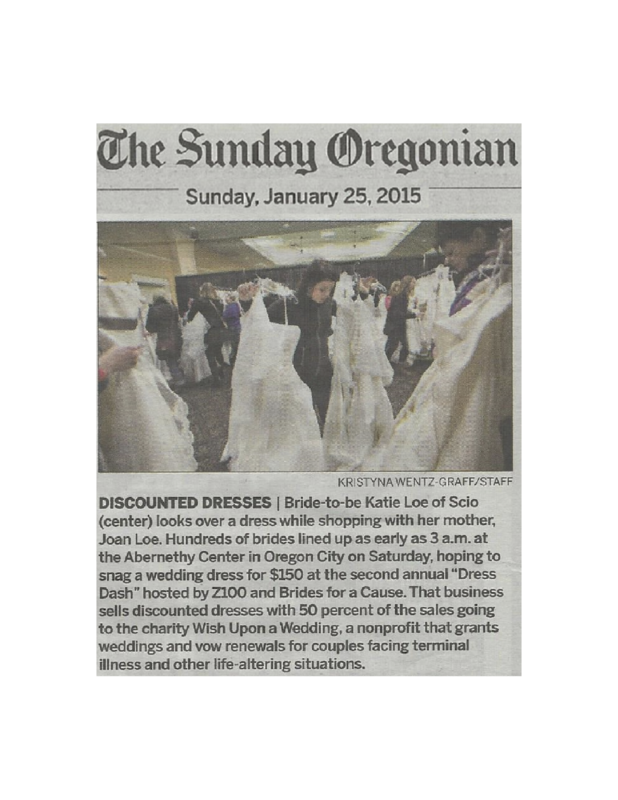 She was one of the hundreds of brides who lined up for the 2nd Annual Dress Dash hosted by Brides for a Cause and Z100 at the Abernethy Center in Oregon City on Jan. 24, 2015. The event featured more than 500 wedding dresses, both new and gently used, that retail for prices much higher than the $150 dollars they sold for at the event. The dresses are donated by bridal shops across the country. Some are new stock that didn’t sell or samples. Others are gowns donated by brides and cleaned and fixed by Brides for a Cause, a business that sells discounted dresses with 50% of the sales price going to a non-profit wedding charity Wish Upon A Wedding. At Saturday’s event, brides started lining up as early as 3 a.m. to get the best selection. This sale allowed Brides for a Cause to clear out their sales floor. Large groups of women were allowed in to shop in intervals. The dressing rooms were a frenzy of activity as brides frantically pulled dresses on and off, trying to find the perfect dress before someone else did. As for Lindsay, getting up at 5:30 a.m. to attend the sale paid off. The gown she had been eyeing at another outlet sold for a hefty $2900, but today she found the perfect dress for her upcoming October wedding, and was tickled to pay $150.